Rafa made the spontaneous decision to buy flights to Bilbao. We very nearly didn't make it what with work commitments, but we wanted to take in the 10th Anniversary celebrations for the Guggenheim Museum. It's been almost a year since we committed to buy our house together, but the completion date has kept being pushed back and we were tired of not making regular plans to have weekends away. It doesn’t seem that long ago I read about how The Solomon R Guggenheim Foundation had built a museum in this industrial city. Back then, in 1997, it had more than its fair share of post-industrial problems. 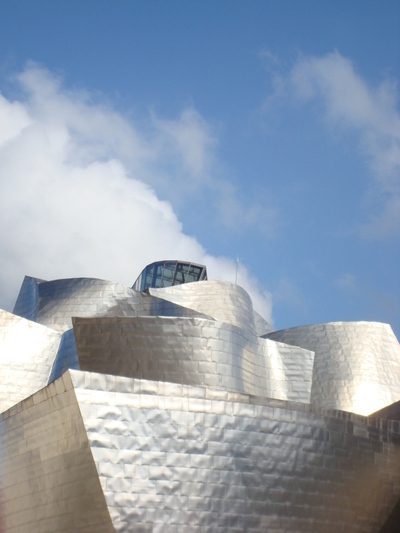 Now, ten years on seems a great time to see the “Goog” & the transformed Bilbao. One has the chance to see how this titanium flower has truly made the surrounding area bloom. The once industrial site, with cranes and a large container depot, is now a sculpture park featuring local artists such as Chillida; and designer bridges, including the Campo Volantin by Santiago Calatrava. It is a vibrant focal point and centre for a cleaned-up city – a magnet for visitors, foreign investment and all things “design”. 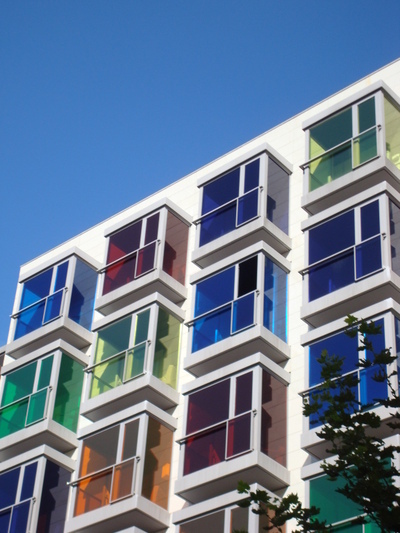 Any one with an interest in contemporary art and architecture will know that Bilbao is a text book case study on how investment in iconic, public building and art can transform the built environment, increasing investment, tourism and the confidence and self-esteem of a city. Many places across Europe have tried to emulate Bilbao's success, but at the end of the day it is the shear ambitious nature of the town council at inviting such world class architects for such significant projects that has led to its unique success. Calatrava’s bijou yet stunning Bilbao airport is the designer gateway for most foreign visitors to the city (Brits have no excuse not pop over to this Basque Country cultural and business hub, since it is cheaper to fly there from London that it is for most Spaniards to fly there internally!). The short drive from the new airport through the lush green valley of pine forests towards the tunnel that takes you to the neighbouring valley of Bilbao makes it hard to imagine just how industrial this place is. However, running north towards the coast are factories and industrial complexes that emulate the landscape of the industrialized north east of England. The city at first appears compact, with the designer hotels (like the colourful Hisperia Hotel, where we decided to stay), nestling around the Guggenheim. To the east is the Casco Viejo, or old town, with its charming Old Square, a great place to try the amazing variety of pintxos together with local wines, beers or ciders. Pintxos are a local interpretation of tapas that can be found in the Basque Country. 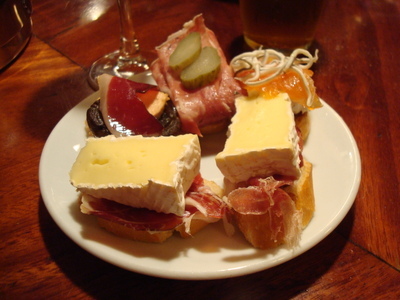 Ingredients are stacked up on a small slice of toast or bread and held in place by a cocktail stick or pintxo. You take what you want and the barman calculates you bill by the number of size of the cocktail sticks on your plate. However, I noticed that many bars had actually done away with the toothpicks altogether and relied on the honesty of the customer when working out the bill. Food quality in Bilbao is excellent and puts some local Andalucian dishes to shame. Despite this, you do have to persevere at first to find some good places to eat and drink in old town, as when you first wonder into the ancient district at night, the dark, gothic style streets can seem a bit drab and the local youth with their “goth” style clothes, died hair and body piecing add a certain small-town grungy feeling. Yet there are plenty of lively bars offering all manner of snacks, from wild mushroom with fois gras, or tiny portions of fillet steak with onions or even sea food creations…just experiment and enjoy! In our experience, the local people are extremely friendly. I almost felt the welcome from locals was a way to compensate for region's mixed reputation due to the ETA terrorists that remain active (and uncompromisingly out-of-sync with public opinion and modern European methods of reconciliation and conflict resolution as demonstrated by the progress in Northern Ireland). The atmosphere is very different from the Mediterranean. Clearly the cold climate, like in the UK, makes for a culture that is more about being huddled together in smoky bars than out on the streets. People seem quieter and more reserved, yet once engaged, they are genuine and enthusiastic. We had many examples of throughout our weekend, from an elderly man offering us a tram ticket so we could catch the next service, to a lady in the street offering detailed and enthusiastic ideas of what to do, to a local in a bar inviting us to a plate of tapas. the city – we don’t get that at home any more, now that we’re on the way to 40! For the culture vultures, there is plenty in the city to keep you busy for a weekend. There are at least 8 or 9 major institutions offering collections of local, national and international art as well as history. For example, the Museo de Bellas Artes has a collection of art from 12th to 20th century in a conventional museum set up. A good place to stop off for a coffee if you’re walking the sculptures gardens and parks of this part of the city. But of course the star is the Frank O. Gehry Guggenheim. I’ve never been a great fan of art galleries – always one to have a quick “overview” than go straight to the bar or café followed by some retail therapy in the gift shop to get some pretentious coffee table book and maybe some postcards. 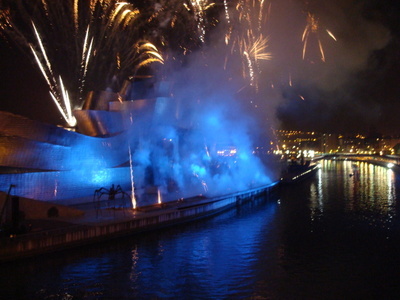 Yet the Guggenheim cannot fail but to demand your time and attention. It’s worth the 10 euros or so to get in just to enjoy the amazing building. Forget some of the complete esoteric, academic “crap” (sorry, art) that’s on show and just explore the gallery spaces – the building is filled with interesting and irregular spaces that you can enjoy in different ways from the floor level, balconies or elevated walkways. The ticket price does include a free audio guide that helps decipher some of the more weird pieces. But for me, art shouldn’t need an audio guide. Take for example, the mammoth steel sculpture/installation “The Matter of Time” by Richard Serra – they are really powerful. It is part of the permanent collection. You can’t help but be engaged by it. Saturday night saw Rafa & I patiently standing in the cold outside the museum for the fire work display; only 15 minutes but it was a suitably impressive way to celebrate the Guggenheim’s birthday. Statistically the Spaniards have not really embraced the place, with most visitors coming from the UK, Germany, Italy & France. Even some of the fiercely independent (almost xenophobic) locals are opposed to the place. Yet its positive effect on the city is indisputable. 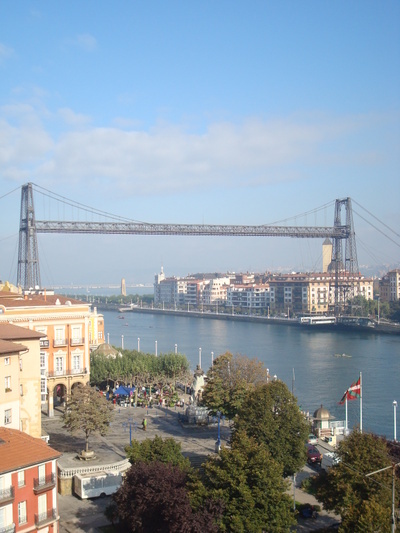 If one takes the shiny new metro (with its Norman Foster designer entrances) north from the city centre, within 15 minutes you can be at the northern coast and the port of Bilbao, with its incredible suspended bridge (“Puente Colgante”). The area is run down and struggles with some militant members of the community. The town hall displays an “ETA NO” banner. I don’t want to get too drawn into politics, but I do find it hard to understand why, in the 21st Century, in the modern, progressive environment of modern Spain with its strong constitution of autonomous regions, and the proactive policies that attract foreign investment to areas such as the Basque Country, why in deed is their any need for a violent struggle? Where exactly is the oppression, if not only in the minds and memories of some of the people? I walked into a small bar to order a glass of wine and some tapas – in Spanish. I was very abruptly reminded that the small, tasty snacks across the bar were not tapas but “pintxos”; “tapas are in Madrid” the owner told me, “you’re in the Basque Country now”. In these independently minded places, even harmless names for snacks have a resonance and meaning far beyond the immediately obvious. Well, I have to say that all-in-all Bilbao has really seduced me and made we want to go back north and explore more of the Basque Country, including the posh, gastronomic town of San Sebastian. But before I book any more trips, I want to have moved into my new house! For more photos from my trip to Bilboa, click here. What an amazing blog you’ve compiled. I stumbled across it this morning and I’m going to enjoy myself going through it. The photography and descriptions of places are so good they act as a catalyst to “see for our ourselves” and go visit. I have a gardening blog myself so appreciate the time and trouble you’ve taken to share your experiences with everyone. Many thanks – I’ll keep returning and send links to interested friends.